Man Utd target Jerome Boateng has called Jose Mourinho personally to tell him that he does not want to move to Old Trafford this summer according to SportBild. The report states that Boateng thanked Mourinho for his interest, but also told him that he wishes to stay at Bayern Munich. The news comes after reports on Tuesday morning suggested that United had offered £25 million for the Bayern Munich centre-back. Mourinho had been a long-term admirer of the player, but this will come as another significant blow for the United manager as frustrations grow with just two days of the transfer window remaining. United had initially made contact with Bayern Munich about the German international just hours after their friendly defeat to the German champions at the Allianz Arena. 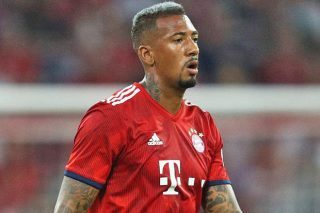 It had been thought that Bayern were willing to sell the defender at the right price, but the report in Bild suggests new coach Niko Kovac has persuaded Boateng to stay. With just two days of the window left, United seemingly have only Toby Alderweireld realistically available out of their initial defensive targets to sign with Boateng and Leicester’s Harry Maguire both set to stay at their clubs. United are still some way short in their valuation for Alderweireld, with Tottenham pricing their man at £55m. It is believed United aren’t willing to spend that much on a player who is set to enter the final year of his contract.